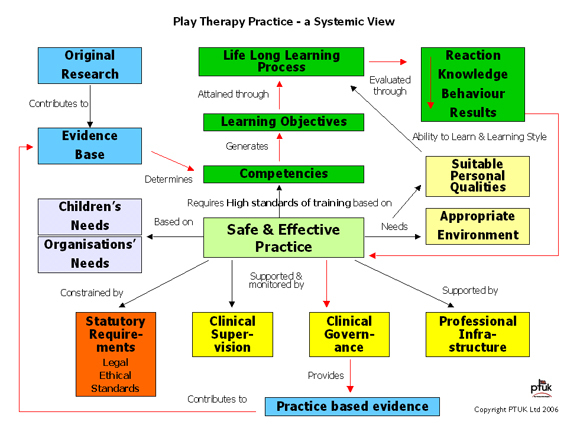 In the absence of any regulation or registration in the field of therapeutic play and play therapy in most countries or states, PTI or its local national affiliates such as PTUK or PTIrl acts as a governing body in a self regulated profession. In accepting this responsibility we have set the highest standards of education, training and practice appropriate to the level of working. We welcome any government’s intention to move towards regulation of the play therapy profession in their country and will work with any other relevant organisation, on an equitable basis, to achieve this. It is vital, in our view, that appropriate standards are set. PTI is concerned that, perhaps in haste or lack of specialist knowledge, inappropriate or ineffectual standards are set. PTI is uniquely qualified to advise upon the optimum standards required for each country or state. By using the database of standard statements with specialist Consultant advice, PTI can assist those concerned with setting standards to quickly draft a set appropriate to their own circumstances. PTI advocates a common international model for play therapy standards that allows each country sufficient flexibility to take into account their own culture, resources and stage of play therapy development. It recognises the need to harmonise play therapy standards and regulation approaches with other mental health professions practising in the country or state.